Use it on everything from boats to apparel. 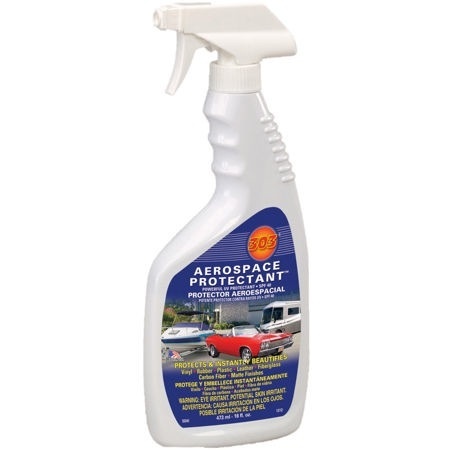 303 Aerospace Protectant is - "SPF 40 For Your Stuff!" Helpful in prolonging the lifetime of your raft. Don't forget to use this on your paddling apparel that have latex gaskets. What leading manufacturer's recommend in: automotive, marine, RV, home, and outdoors! For use on vinyl, clear vinyl, inflatable boats, fiberglass, rubber & all UV sensitive plastics. Easy to use - just spray on and wipe dry! This is an environmentally safe product that is non-toxic and biodegradable.